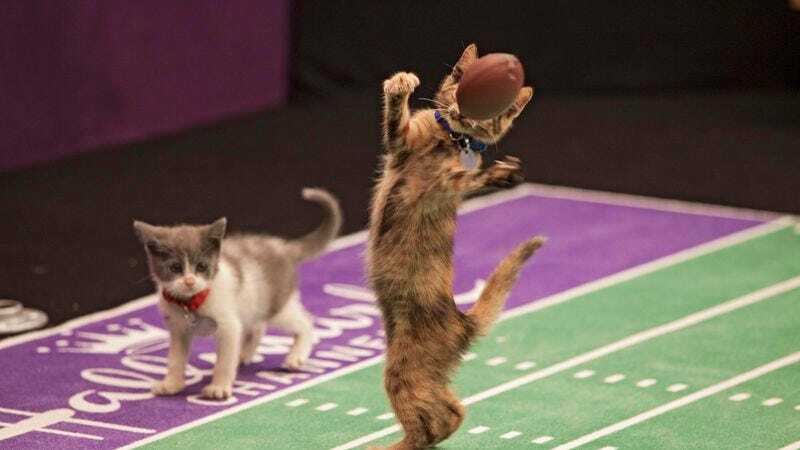 In an attempt to secure the key “concussion patient,” “pothead,” and “5-year-old girl” demographics, The Hallmark Channel has announced plans to start an all-kitten football league. Called the Feline Football League, the league “will seek out only the best and cutest kittens,” according to The Los Angeles Times, to engage in full-contact snuggles building up to the network’s second annual Kitten Bowl on “Su-Purr Bowl Sunday.” (Hallmark‘s Kitten Bowl, of course, was started as a response to Animal Planet’s seemingly evergreen Puppy Bowl, which is in its astonishing tenth year.) The kitten “games” will be available for viewing on the Hallmark Channel’s website and various social media outlets starting in November, providing sports and cat fans with yet another excuse to eat chicken wings and get blackout drunk.